No Hamburg, NY home is complete without the elegant privacy and security of custom fencing. The Vinyl Outlet is Hamburg, NY and Western New York's premier vinyl fence designer and installer, carrying only the highest quality PVC vinyl fencing product. Customized fencing completes your dream home allowing for the security and privacy that you deserve. Installed by the finest and most experienced craftsmen, The Vinyl Outlet will install custom fencing that will leave the neighbors envious. There are many options from which to choose when selecting a fencing product. Wood, composite and vinyl are the most common fencing materials. Installing custom fencing is an investment, not just into the value of your home, but into your family's privacy and security, as well. Vinyl fencing is the most durable and maintenance free customized fencing option, guaranteed to last for decades. Although wood fences are less expensive, weather conditions require wood product to be continuously maintained and refinished, especially with the harsh winters of Western New York. Composite fencing is manufactured from a mixture of recycled wood fibers combined with a plastic component for binding. More durable than wood, composite decking still absorbs moisture and can mold and mildew in humid weather conditions. Many homeowners regret their choice to install wood or composite fencing, especially when they are required to maintain it yearly. 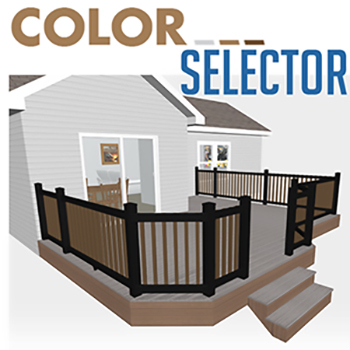 With numerous color and style options available, customized fences add unique style to your property. Color Option. Three fade resistance options. Decorative Toppers. Picket, lattice, and more. Transition Panels. Create multiple heights. Gates. Adding strength and security, single or double gates are available in multiple styles. Caps. Top off your fence in style. The Vinyl Outlet is proud to provide high quality, beautiful customized fences to homeowners in Hamburg, NY. Contact us today for a consultation and to begin designing and building the outdoor spaces that your family desires.